U.S. President Donald Trump told former Arkansas Governor Mike Huckabee in an interview released over the weekend that evangelical Christians are more grateful than Jews for his moving of the U.S. embassy in Israel from Tel Aviv to Jerusalem. Trump said that the reaction surpised him. 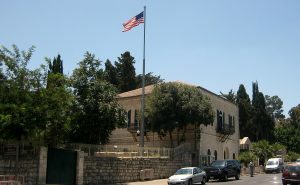 The embassy was moved from Tel Aviv to Jerusalem, despite decades of unfulfilled promises of past administrations. The world-wide pleas to not got through with it had to be ignored in the final weeks and days before the move, President Trump said. Palestinians and much of the world community deplored what Donald Trump did. But, as Donald Trump stated, what he did was an important event. But it’s also worth picking out another part of what Jeffress said to CNN. Jerusalem, he said, is “the touchstone of prophecy.” That prophecy is the biblical prophecy of the return of Jesus Christ and the beginning of the Rapture — the end times. “What kick-starts the end times into motion is Israel’s political boundaries being reestablished to what God promised the Israelites according to the Bible,” Pastor Nate Pyle told Newsweek in January. This is not an uncommon view. Evangelical Christians overwhelmingly support President Donald Trump because they believe he’ll cause the world to end. Many have questioned why devout evangelicals support Trump, a man who has bragged about sexual assault, lies perpetually and once admitted he never asks God for forgiveness. Trump’s lack of knowledge of the Bible is also well-known. Trump has good reasons to cultivate their support: Some 80 percent of evangelicals, representing approximately 36 percent of the electorate, supported Trump in the 2016 elections. The inspiration for Christian support for Israel is linked to Genesis 12:3, in which God promises Abram: “I will bless those who bless you, and whoever curses you I will curse; and all peoples on Earth will be blessed through you.” Theologically, support for Jews in the Holy Land dates back as far as the 16th century. Politically, it dates back to the late 19th and early 20th century, when British evangelical leader William Hechler worked with Theodore Herzl, the founder of political Zionism, to promote the idea of a Jewish homeland. Some Christians believe World War 3 will start this year. Because of Donald Trump’s decision related to Jerusalem, some think this will make it easier for a ‘Third Temple’ to be built there and that Donald Trump is the biblical ‘Cyrus’ (see Donald Trump reportedly a ‘Cyrus’ preparing the way for a new Jewish temple). Many evangelicals believe that Donald Trump is ushering in the end times (watch Evangelical support for Donald Trump’s Jerusalem policy). Although we in the Continuing Church of God are NOT Protestant, hence not evangelicals, regular readers of this COGwriter Church of God News page are aware that I have written for years that Donald Trump was ‘apocalyptic’ (watch also Donald: ‘Trump of God’ or Apocalyptic? and/or read my book Donald Trump and America’s Apocalypse). Is Donald Trump’s Jerusalem embassy move at all prophetic? Partially because of his decisions, in time, events will happen in Jerusalem that will one day result in animal sacrifices being resumed. Bible prophecy shows that those sacrifices will be stopped by the King of the North (Daniel 9:27b, 11:31) who will align with the final Antichrist. Until then, there will be conflict and even temporal peace in the Israel/Palestinian region. For now, US President Donald Trump believes he has increased reasons for evangelical Protestants to vote for him, should he choose to run for re-election in a couple of years. Donald Trump continues to be apocalyptic. Hope of Salvation: How the Continuing Church of God differs from most Protestants How the real Church of God differs from mainstream/traditional Protestants, is perhaps the question I am asked most by those without a Church of God background. As far as some changes affecting Protestantism, watch the video Charismatic Kenneth Copeland and Anglican Tony Palmer: Protestants Beware! [Português: Esperança do salvação: Como a igreja do deus difere da maioria de protestantes]. A sermon is also available: How Does the Church of God Differ from Protestantism? This entry was posted on Monday, June 25th, 2018 at 3:00 pm	and is filed under Religious News. BBC: Why do US evangelicals support Trump’s Jerusalem policy?